The Hilton London Euston hotel is only five minutes from Euston Station and within a mile of London's city centre. 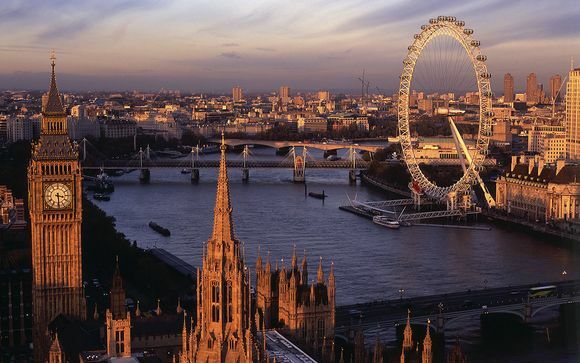 Close to the best London attractions such as Oxford St, the London Eye, Regent's Park and the British Museum, this London hotel the ideal place to stay to experience everything London has to offer. The average London street transports you back centuries with its architecture, and across continents with its population. Brimming with iconic British emblems – the ubiquitous black cab; the Houses of Parliament's soaring limestone peaks – London unites a colourful history and solid traditions with boundary-pushing creativity and true multiculturalism. Whether exploring one of its glorious markets or taking it easy in a soft green park, expect to see faces from all corners of the globe. Home to leading department stores, designer boutiques and high-street labels, Westfield Shopping Centres can be found in the areas of White City and Stratford. Set in a stunning Victorian building, the hotel boasts luxurious accommodation, a gym and sauna. Relax after a busy day in the cool tones of the guest room, featuring convenient amenities such as wireless internet access and a beautiful marble bathroom. Enjoy fine dining in the smart conservatory of Woburn Place dining room. Bask in natural light as you dine on the delicious international cuisine. The cancellation terms and conditions differ to that detailed in our terms and conditions and are likely to result in 100% loss of monies paid. This is definitely the case if cancelling within 7 days of arrival. Please note: this hotel has recently undergone a full refurbishment that did affect some guests. We now have confirmation from our supplier that the refurbishment is now in its final stages and that guests will no longer be affected. We also have received a guarantee that our members will be allocated one of the recently refurbished rooms. 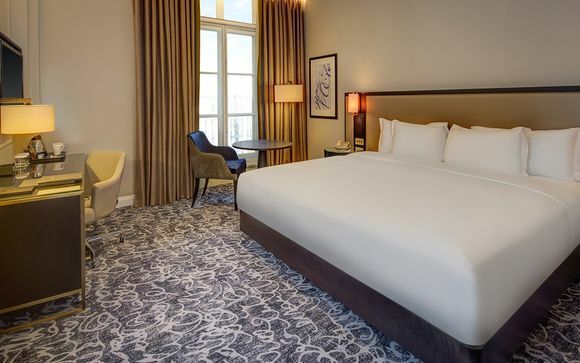 Just for you: guaranteed upgrade to a Deluxe Room. Enjoy a stay in a Deluxe Room where you can expect classic decor and light furnishings in a Victorian townhouse setting. Natural light streams through the large Victorian-style windows. This comfortable room provides complimentary bottled water on arrival. Stay connected with WiFi and catch up on work at the desk or unwind on the easy chair and watch an on-demand movie on the flat-screen TV. Refresh in the bathroom, offering a combined bathtub and shower and a range of exclusive bath essentials. Special touches include a bathrobe and slippers. Just for you: 20% discount on food and beverages purchased at the hotel. At Hilton, dining options are designed with you in mind. Start the day with a hearty breakfast or nutritious light bite, savour innovative dishes prepared with only the freshest ingredients, or simply relax with a cup of coffee in the hotel lounge. Mulberry's Restaurant - This informal restaurant, on the Hilton London Euston hotel's lower-ground floor, is popular for its Hilton Breakfast. Start the day with a 'full English' or coffee and croissants from the buffet. Woburn Place Bar & Lounge - Smart but relaxed, this Hilton London Euston bar is a great choice for a light lunch or dinner. Sink into comfortable sofas and enjoy a pre-dinner drink. Woburn Place Dining Room - Daylight pours into the Hilton London Euston hotel's flagship restaurant, set in a stunning Victorian conservatory. Waiters at this busy London Euston restaurant weave in and out of its elegant ornamental pillars serving up international fusion cuisine for lunch and dinner. From Heathrow Airport - Depart onto A4 then onto A315 take second exit to A402 Exit at roundabout onto A40 Continue straight onto A4209 Lancaster Terrace. Continue onto Euston Rd, bear left onto A501. Turn right onto A4200 Upper Woburn Pl then turn right to Endsleigh Gardens. From London Gatwick Airport - From London Gatwick Airport, taxis are available to take you directly to the Hilton London Euston hotel. The journey normally takes around 70 minutes from the airport to the hotel forecourt. You will receive an email confirming your booking within the next 48 hours.Please check all details on this confirmation are correct.